I have been working almost since the start of me DIY to create this recipe and it has been so hard for such a simple profile. This is the closest i have got to tigers blood shaved ice flavor. TPA strawberry and INW shisha strawberry - These 2 strawberries help create the candy syrup strawberry in tigers blood. TPA coconut and TPA coconut candy - Still looking for the perfect coconut for this profile but these are the closest i have come. Purilum watermelon - The perfect candy watermelon for this mix, the secret ingredient. If you don't have this flavor and love watermelon GET IT NOW! CAP super sweet - optional but tigers blood is usually very sweet so i would recommend. Notes - After making 120ml and having it steeped seems as if the coconut comes through more and could be reduced a bit in the recipe. Major note - this uses TPA coconut not TPA coconut extra! This recipe is the property of jyroe and released under the CC Attribution-NonCommercial-NoDerivatives 4.0 license. You may not copy, derive or commercialize this recipe without following the terms of this license or the explicit permission of the creator. Yup. one of the best damn mixed fruit vapes I've ever had. Hands down. I took your advice and cut down the coconut by maybe just 0.15% or so, still comes through very clearly in the mix though, and it's delicious. All the fruit blend together seamlessly, but that candy watermelon really shines backed up by that smooth coconut. Literally can't even find any offnote to nitpick, it's just a really enjoyable vape that I keep craving whenever I switch to something else. After many average attempts, the search for a good Tiger's Blood is over. Perfectly balanced and simply delicious, you nailed the profile. Nicely done! dont have PUR watermelon any sub? One of the complaints on ATF is the lack of reviews so I'm going back and commenting a few recipes I've made more than a few times and this is one of them. I don't do a lot of tropical type vapes but I mixed this one up several times over the summer. Good stuff. This is without question one of the top five recipes i have had all year , its right up there with @shyndo mango sticky rice , @fear Abuela, @rageisalotof work Sad Lad , and anything AT ALL BY @ID10T, and then Tiger's blood by non other than @Jyroe who's turned out to be a good friend and all around good guy but thats not why i honestly believe this deserve as close of a look as another other recipe this year for the top spot . it is no surprise to me at all that of the big name mixers that i challenged to unseat this tigers blood recipe not one did, thats because it can not be done any better than this one already has . Excellent recipe! TFA Strawberry and TFA Coconut were in my very first DIY order of five flavors. TFA Watermelon was in the second order of five more flavors. Other strawberry, watermelon, and coconut flavors followed soon after. So, I made many variations of Tiger's Blood a long time ago, mostly tweaking others' recipes to try to improve them. More recently, I made a few fresh attempts at it because Graham said it would help make Jyroe shut up, somehow. None of them have been worth sharing, yet, this is much truer to the source material than Graham's recipe, and Jyroe has a reason to not shut up. Of all those Tiger's Bloods, this is the best. The use of TFA Coconut here is especially commendable because that is absolutely the right coconut for a Tiger's Blood shaved ice flavor. If you're trying to make an authentic Tiger's Blood snow cone vape without any TFA Coconut, you're doing it wrong. I wouldn't be surprised to learn that TFA Coconut is used to make the actual coconut snow cone syrup. There are indeed "better" coconut flavors out there, but this is the right one for this particular job. It's tricky because too much is suntan oil, though. Coconut Candy works to push that coconut flavor further without it getting weird, since it's another candy flavor and not a realistic coconut, which would be out of place. It might be a tenth of a percent or so too high for the hint of coconut in Tiger's Blood, but that's the only place I see room for improvement here. The added depth form the CAP Golden Pineapple is masterful. The strawberries are a good fit as well. PUR Watermelon seems like candy watermelon cheat mode. But I've used it in my recent attempts and still not reached this level of awesomeness. It tastes like a great deal of work went into this thing. My only real problem with it is that title is missing the possessive apostrophe. Tiger's Blood, not Tigers Blood. It's a shame because people might come to ATF searching for "Tiger's Blood" and not have this recipe pop up in the results. Best Soap I have EVER vaped. Serious talk, this is a great recipe. It is simply a really good tigers blood that does not taste like soap, candles or suntan lotion. If Tigers Blood is your thing you will love this recipe. I must say that I love this recipe. I have been meaning to put a review on it for awhile but just have not got around to doing it. I have vape 180 mls of this in just over a month. It is very tasty. This is a really good recipe and gives of a nice candied watermelon flavor with a nice balance of flavors. Excellent job on this recipe. Easy five star review. While a little one dimensional, that isn't necessarily a bad thing. The flavor is potent, sweet, in your face syrupy sweet watermelon strawberry with a back note of coconut. A little acid could set this off but that may be because I am vaping this at 80 vg which lends an almost bubblegum mouthfeel. Fantastic in your face flavor and probably exactly what people coming straight from commercial juice are looking for. First Tigers Blood in vape form that does NOT taste like shampoo! It tastes great watermelon heavy with an encompassing strawberry and the coconut just tastes correct in this, the pineapple was a bit of a surprise but adds some depth... Great job!!! This recipe is wonderful! It is a little light on flavor, but I really have nothing negative to say because it hits the spot and really reminds me of the actual snow cone flavor. 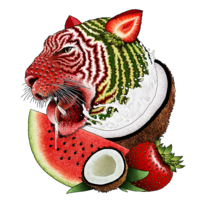 When you think of tigers blood you think of strawberry, watermelon, and coconut. However, Jyroe took the flavor to another level by adding golden pineapple. That was a great move and makes everything just that much more syrupy sweet. It's all balanced really well and I get absolutely no suntan lotion taste from the coconuts used. 5/5 would vape again. Ok peeps this recipe is on the money. When I was a teenager and the shaved ice booths started popping up in my city I remember the Tiger's Blood flavor. The very first toot on this recipe took me straight back to when I was 13 years old. It nails that flavor perfectly. Very tropical and refreshing shake and all day vape. I crushed 30mls of this stuff in a day. This is a great recipe I highly recommend getting these flavors in you stash and mixing this up. You will not regret it. Great job man.